In this lively dance, the young Krishna sports bells on his waist and ankles. His right hand is held in abhaya mudra, the gesture of protection. One of the Hindu god Vishnu's most popular incarnations is Krishna. In fact, he is so well-liked that many of his devotees do not even count him as one of Vishnu’s incarnations, but think of him as “God without Equal.” Not surprisingly, his mythology is highly developed, beginning with his adventurous childhood. He was raised as a foster child among cowherds and milkmaids, constantly pulling pranks and fighting demons. His parents and friends were granted glimpses of his divine nature now and then. One day, Krishna’s foster-mother rebuked him for having eaten some earth. He denied it, so she forced him to open his mouth. To her amazement she saw there the whole universe, and for a brief moment she perceived Krishna’s true nature. 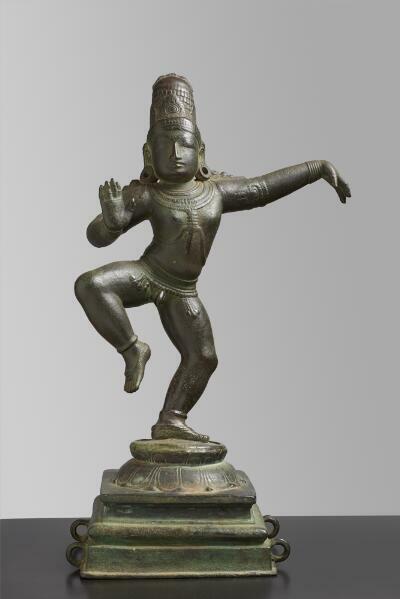 In this harmoniously balanced sculpture, the artist portrays Krishna as a winsome boy. He is gracefully poised in dance, with one plump leg raised, and the other bent to support his weight. He stretches one hand out in a dance gesture called karihasta, or elephant trunk, while the other hand, with its palm facing outwards, promises protection to the devotee. His naked body is adorned with lavish jewelry, including a traditional girdle of bells around his waist.